It’s a real risk in Dallas now. The Dallas-Fort Worth area has a 1 to 5 percent chance of experiencing an earthquake strong enough to damage buildings in the next year, the U.S. Geological Survey said Monday. That risk has grown tenfold since 2008, when the area began experiencing a surge of mild to moderate-sized quakes, said Mark Petersen, chief of the National Seismic Hazard Mapping Project at the USGS in an exclusive interview with The Dallas Morning News. North Texas’ earthquake hazard is now on par with parts of Oklahoma and California. “One of the big concerns for me is that there is a very high population density in the Dallas-Fort Worth area, and this activity is taking place within that area,” he said. Last week, The News obtained a report, produced by the Federal Emergency Management Agency, detailing the potential damage from earthquakes of magnitude 4.8 and 5.6, which fall within the hazard map predictions. The vast majority of damage to buildings would be minor, such as cracks in walls and ceilings. “I don’t want people to feel like their houses are all going to come down,” Petersen said. But he said he couldn’t rule out a larger earthquake because the Dallas-Fort Worth area has long faults running through it that may have the potential to rupture. Earthquakes and their risks are in the news this week because of a new report from the US Geological Survey that mapped out the risks of both natural and human-induced earthquakes. Here’s NPR. 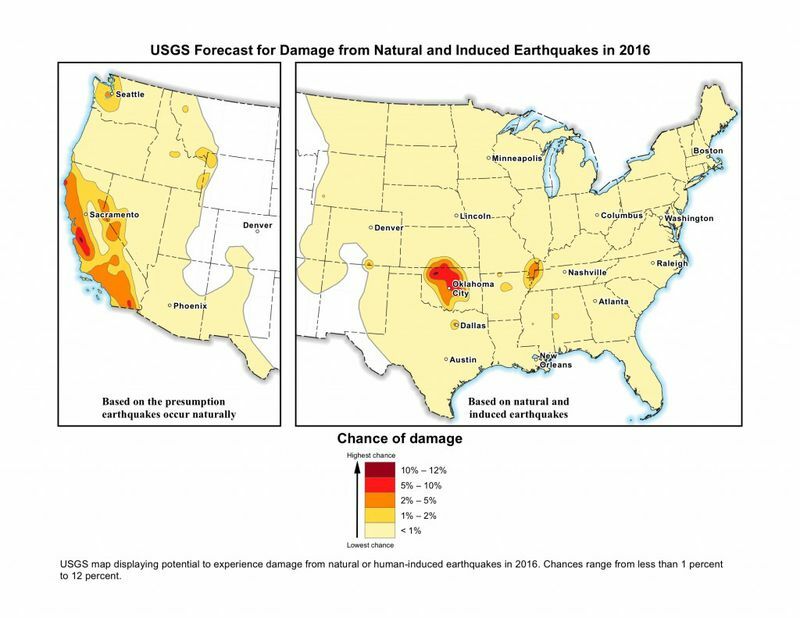 The new maps also include the risks of natural quakes around the country, as they have in the past. Those risks haven’t changed much. But the number of induced quakes has increased tenfold since 2014, according to the USGS. Mark Zoback, a geophysicist at Stanford University who studies induced quakes, says: “It’s important to recognize the risk that these maps point out, but that risk is going to change depending on what’s happening on the ground.” Wastewater wells may not be active for more than a few months or a year; after that, they may no longer pose a risk. Meanwhile, it can take years for a state or community to change building codes to make structures more quake-sturdy. Can’t wait to see what the discussion of this looks like in next year’s Legislature. Assuming they’re allowed to talk about it at all, of course. Vox and the Chron have more. You should be publicly flogged for characterizing either DFW or North Texas as “Dallas.” Most of the area at risk is in either Denton or Tarrant county.